Using Bridge’s PDF-generation feature with the Adobe Output Manager and Photoshop CC is a great way to put multiple copies of an image on the same page for printing. 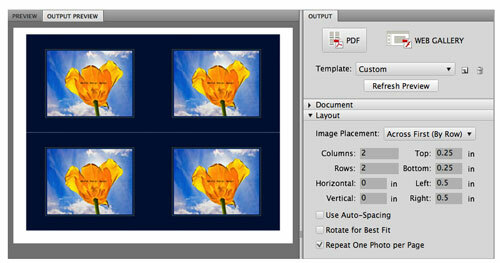 Suppose that you need to print a dozen copies of an image, each at 4×5 inches. Printing each on a separate sheet of paper takes 12 sheets (oh, the cost!) and 12 print cycles. Define a custom layout in Bridge’s Output panel to put four 4×5 images on a single Letter size page, and you use three sheets of paper and wait through only three print cycles. Um, lwhich do you want to do? You have to do the math to get your picture packages to print at the size you want. In this example, assume you want 4×5 inch prints. Therefore, you split the difference between size of the prints and paper in the Top/Bottom and Left/Right margins.